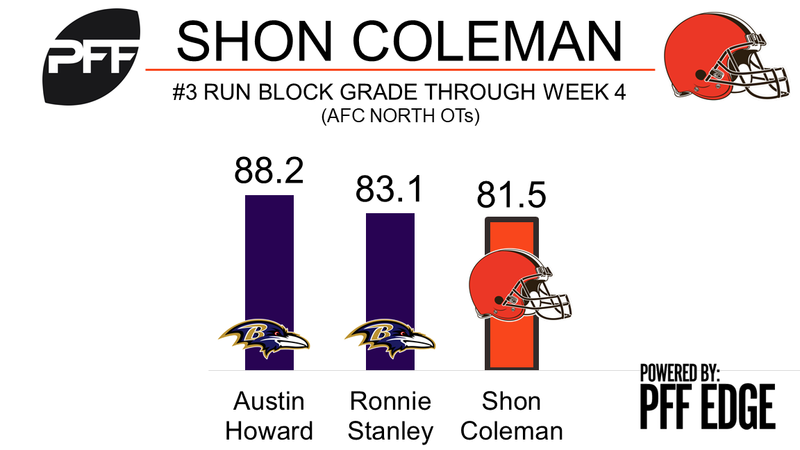 Offensive tackle Shon Coleman was one of the few bright spots Sunday in the Cleveland Browns 31-7 loss against the Cincinnati Bengals. He finished the game with an overall grade of 86.3, the highest grade among all Browns’ players and the third-highest among all tackles in Week 4. With a tough matchup against the 29th-rated edge defender Carlos Dunlap, Coleman held his own, allowing three total pressures (all hurries) on 47 pass snaps. He has not allowed a sack since Week 1. Continually showing improvement, Coleman currently grades 18th among 68 qualifying tackles, with an overall grade of 76.4. His run-block grade of 81.5 currently ranks 18th as well.